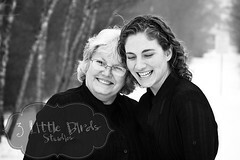 3 Little Birds Studios: Mother's Day is coming! When asked what people would want to save most from their home if it caught fire, after family and pets, most people say the family photo albums and photographs. Why is this? Photographs capture the moments in our lives when we are happiest, and let us look at reminders of the love we have in our lives and those who mean the most to us. Mother's Day is right around the corner, and while the mall and shops may offer the "perfect" Mother's Day gift, this year think about giving her something that she will truly treasure, a family photo shoot! Maybe it's time to gather all the grandchildren together to take a picture that she can put out for everyone to see, or a generational photo shoot showcasing the mothers of the family! Whatever it is, she will love it, we guarantee. We will schedule your shoot on location at your home or at a location of your choosing, at your convenience. We provide gift certificates to give out that can be redeemed at any time. We believe that every photograph is a moment of love. Show Mom your love this Mother's Day in a unique way!